One of the places we were most excited to check out was Cambodia, and the incredible Ankgor Wat Temples. Once we made it to them, they didn’t disappoint. But first, before we actually made it to the temples we did have a full 8 hours, and why would we waste that on sleeping? We stayed at the Funky Monkey Hostel, which is a must for any party people who are ready for an adventure. The hostel is amazing, they have private rooms, a swimming pool, 2 bars and they turned their rooftop bar/restaurant into a beach bar by actually hauling sand upstairs. We arrived to the hostel at about 745 pm, and while we were checking in the mentioned that there was free Keg beer at the “beach bar” starting at 8 pm. The sensible thing to do was run to the rooms, drop the bags and cruise on upstairs to indulge in free beer. Within the first hour we polished off 3 pints of beer each then decided between the three of us ( our friend Daniel was with us ) we should order a beer tower which was another 9 pints. We played beer pong and other games till around 1 in the morning then remembered that we had booked a tour to start at 4 am, taking us to these magical temples we were so excited to see. of our time at the 3 main temples. Angkor Wat is the main temple and it’s huge, that is where we watched the sunrise, but I was more wowed by the other two, The Bayon Temple which is all the beautiful faces, and Ta Prohm which is referred to as the tree temple because the trees grow right through the old temple walls. As we were walking around in the 40 degree weather with our clothes sticking to us from the humidity we were all left in awe over how they actually built these temples, all the work put into them is beyond anything I can even imagine! Since we had a lot to drink the night before and we were over exhasted there were a few moments that should probably not be shared, but will be! Justin and Daniel found these statues that looked almost like a dog/dragon. They used to have tails, but obviously now only have holes in their rear ends, so the two boys decided it would be a great idea to shove their hands in the hole. Then to top it all off with our disrespectful-ness Justin shoved a 2L water bottle into the hole, we couldn’t contain ourselves so had to leave that temple before we got kicked out. After touring around the temples for almost 10 hours we decided to get some food, we piled back into our little tuk-tuk and asked our driver to take us for lunch. Half way down the road there was a totally random torrential downpour, which happens quite often so our driver was prepared, he jumped off his bike in the front, ran around and started putting down the canvas sides of our ride so we didn’t get wet. While we were all paying attention to him franticly changing our ride around Justin noticed a little friend who joined our group. There sitting on Kostners lap was a toad, and he was huge. Once we all realized this guy was inside with us we started to freak out and he proceeded to hop all over the inside of our tuk-tuk. Funny to look back on, but not very funny at the time. Later that evening we decided to go get some dinner. We weren’t really in the party mood because we were so exhausted from the day before and all the adventures we just went on, so we were just going to have some pizza and then go back to the room and chill. Obviously that did not happen, we found a pizza place, but it was a “happy” pizza place and the pizza is made with pot. When in Cambodia do as the Cambodians do…. ??? Well that’s what we did, and the night progressed from there. smoking a cigar while I drank a beer. It’s a story that’s for sure! 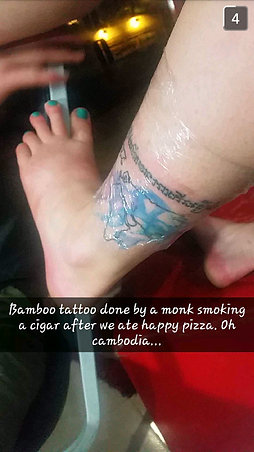 So there you have it 24 hours in Cambodia, Party all night, Tour all day, have some Happy pizza and get a tattoo.. and I wouldn’t change one minutes of it!